First impressions make lasting impressions, and you want your home to have a lasting impression on potential buyers, for the better. When selling property, there’s a tried and true, surefire way to help create a positive, lasting impression and attract potential buyers who are ready to make an offer. I’m talking about impactful curb appeal. Bring out the best of your home’s exterior by maximizing your curb appeal. The first view of your home should draw people in, wanting to see more of what’s behind the door. Achieving this can be done by taking some key steps to prepare your yard and garden before you take photos and list your home on the market. First and foremost, a clean-up should be done. This includes everything from basic yard maintenance, to pressurewashing the siding, cleaning windows inside and out, and making any needed repairs. No matter what time of year you are selling, be sure to have your gutters cleaned and kept free of debris. Replace any broken paving stones or repair damaged walkways. A Quick Tip: Establish a regular yard care schedule; hiring a service while your home is on the market is a great way to keep your home in shape without the added stress of doing it yourself. Get to know the latest trends in landscape design. Like home builders, landscape designers look towards what home owners want for inspiration, and so can you. Some current trends look to be here for the long term. Solar lighting and environmentally friendly yards are continuing to grow in popularity. Lighting adds a sense of warmth and architectural enhancement to any outdoor space. Solar lights save on energy and come in an endless variety of styles. Landscaping with native and climate appropriate plants is a simple way to help conserve the environment and add impact to your front yard. It’s worth paying attention to walkways leading to your front door. Creating a focal point along a path is a great way to help direct visitors into your property with a desire to see more. 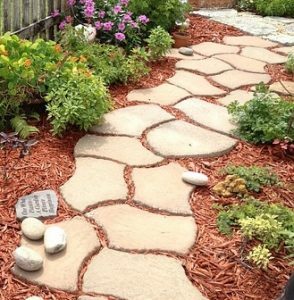 Paving stones set along a gravel path will delineate the space with style and function. You can take this idea a step further and include different paving materials to create an artful pattern along your drive or walkway. Add in a sculpture or fountain for a unique statement to remember. There’s also been a growing trend in creating outdoor living spaces. 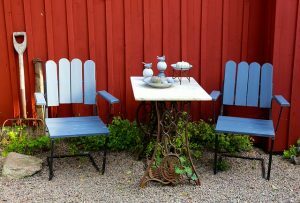 Take advantage of your front porch or stoop and set up a sitting area with chairs, a table, and some potted plants to establish a feeling of comfort and ease. This can also come in handy during a busy open house. 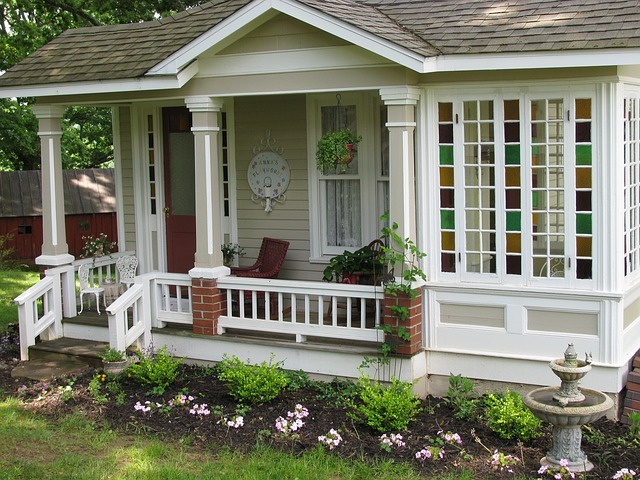 If you don’t have a porch, this idea can still be done in the yard near the entrance. 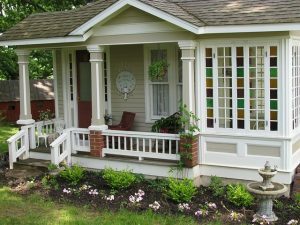 Porch or not, enhancing your entry way is an important aspect of impactful curb appeal. Doing so will create a welcoming entrance for potential buyers. Hanging unique and colorful house numbers can help set your address into the minds of viewers. Potted flowers are an easy way to add color without going overboard. Vintage style light fixtures, letter boxes, and décor add a classic architectural feature which can work with most any type of house. Impactful curb appeal can help attract potential buyers sell your property. Discover more ideas about the latest curb appeal trends with this Better Homes & Gardens article. When you’re ready to sell or buy property in York County, you want a team you can rely on. The Jim Powers Team of local, experienced Realtors® is here to help you through the entire process. Our goal is to help you from start to finish, with complete satisfaction. Visit our website to learn more, then contact us or give us a call at 717-417-4111, to get the conversation started.